The case against the activists had been formally closed since November 2016 because of the failure of the Crown Prosecution Service (CPS) to pursue the case. The case was reopened in March 2017, following an application by the CPS. ​The forthcoming ruling of the High Court has been identified as of broader importance since it will likely concern availability of the legal defences of prevention of crime” to individuals that act to prevent war crimes and crimes against humanity. The activists contend that in the absence of any meaningful intervention from the state, or in cases of state complicity, individuals must be free to act to prevent torture or the mass indiscriminate killing of civilians, without persecution. On 15th April 2016, the eight activists were acquitted at Stratford Magistrates Court of seeking to obstruct one of the world’s largest arms fairs. They had been accused of Obstruction of a Public Highway by blockading roads to frustrate the setup of the DSEI arms fair in September 2015. The activists successfully asserted that their actions were justified since they were seeking to prevent greater crimes including the promotion for sale of torture weapons, internal repression in Bahrain and the mass indiscriminate killing of civilians in Yemen, Palestine and Kurdistan. Civilians in Yemen are continuously being killed by the Saudi led coalition. A report by the Yemen Data Project found that more than a third of air strikes have hit civilian sites including schools, hospitals and mosques. Some attacks have used UK bombs and cluster munitions. The UK has licensed over £3 billion worth of arms to Saudi Arabia since the onslaught started two years ago. According to the UN, more than 10.000 people have been killed and 2.8 million driven from their homes by fighting across the country. Famine has affected approximately 17 million Yemenis, 7 million already suffering from acute malnutrition and 3 million facing acute malnourishment. The World Health Organisation has warned of the new cholera outbreak in the country and the state is on the verge of collapse. Following the verdict, the CPS twice sought to appeal the acquittals, but was rejected by DJ Angus Hamilton on the basis that the CPS applications were “dishonest”, “frivolous” and “misconceived”. The CPS finally applied directly to the High Court seeking a judicial review of the activists’ acquittal. The CPS does not dispute any of the facts found by the Magistrates Court as to wrongdoing at the arms fair and complicity of its regular invitees in ongoing war crimes. Rather, it contends that the judge should not have allowed this evidence to be heard. A full (one day) hearing has been listed at the High Court for Tuesday 13th June 2017. The activists oppose the CPS claim and will be represented at the hearing. The activists’ acquittal at Magistrates Court represented a particularly damning indictment on UK arms policy since, unlike previous cases where activists were acquitted on the basis of preventing war crimes, it cannot be written off as a mere perverse verdict by an emotional jury. Rather, an experienced District Judge in an apparently impartial tribunal of fact found evidence of serious wrongdoing at DSEI after listening to many hours of expert testimony from internationally regarded experts at leading NGOs. The DSEI (Defence & Security Equipment International) arms fair takes place every two years in London’s Docklands, and is jointly organised by Clarion Events and the UK Government. Buyers include countries involved in conflict and from human rights abusing regimes. Exhibitors attend from around the world, including most of the world’s largest arms companies. Organisers and arms companies breached UK arms legislation in at least three of the last four DSEI exhibitions, and not once has any exhibitor or organiser been prosecuted. Human rights observers were prevented from entering the last DSEI (in September 2015). The DSEI arms fair is set to return to East London this September. This case has served to fuel the increasing momentum against it. It is anticipated that resistance to it will be bigger than ever before. 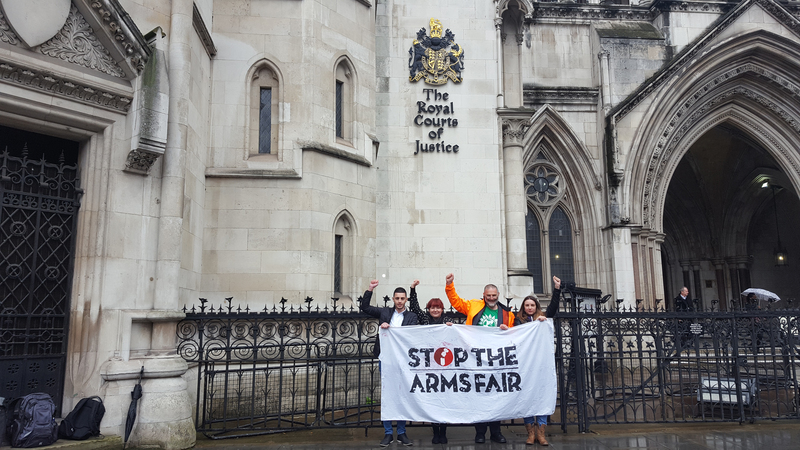 The activists acquitted of seeking to obstruct DSEI 2015 are: Isa Al-Aali (Bahrain), Lisa Butler, Angela Ditchfield, Thomas Franklin, Susannah Mengesha (UK), Luis Tinoco Torrejon (Peru) and Bram Vranken (Belgium). In the same weeks that the case against DSEI activists was reopened, two family members of expert witness Sayed Ahmed al-Wadaei – who gave evidence at the DSEI activists trial – were detained by the Bahraini government in retribution for his speaking out about human rights abuses perpetrated by the regime. His mother in law and brother in law are still being held and there is grave concern for their safety following reports that they have been subjected to torture. Several of the activists will be represented at The High Court by solicitor Lydia Dagostino of Kellys Solicitors in Brighton, and barristers Owen Greenhall of Garden Court Chambers and Edward Fitzgerald QC of Doughty Street Chambers. Full text of District Judge Hamilton’s first and second refusal to appeal, and expert evidence available upon request. Click here for more information on the detention in Bahrain of expert witness family members.